It must have been frustrating, not knowing what had happened. Thankfully, it all turned out to be good news for India. When the eighth wicket fell at 124 and India needing close to a hundred runs to win, everyone (including me) had written India off. With Laxman batting with a bad back and a runner with Ishant Sharma at the other end and just Ojha to follow, it was only going to be a matter of time….but the fat lady hadn’t sung yet. Somehow, Indian managed to pull it off – this will be remembered as one of the great wins on Indian soil, and firmly belongs with other classics such as Calcutta 2001. The architect of that Calcutta win was again responsible for guiding India through and IMO, should have been named the man of the match. Zaheer went away with the award, but it was Laxman’s magic that eventually won the game. Laxman has had a great run this year and while most people have a modest record in the 2nd innings – Laxman has thrived (his 2nd innings average is 50.47 compared to his 1st innings average of 45.67). Since 2009, every time he has been asked to bat in the 2nd innings, he has had a 50+ score. Laxman has also always reserved special treatment for Australia, against whom he averages 55.58 as opposed to 44.53 against the rest. Credit should also be given to Ishant Sharma – coming in at No. 10, he scored 31 valuable runs and more importantly built the highest partnership in the Indian second innings of 81 runs with VVS Laxman. When he was out LBW (which was a questionable decision) to Hilfenhaus , India needed just 11 runs to win. What an effort! After a few tense moments of close LBW shouts, over throws, and confusion while running between the wickets, India managed to get those 11 runs. What a win! Although the match was a nail biter in the end, it had its constant ups and downs. Each team somehow contrived to lose a good position every few hours and the match could have gone in either direction. One can’t help but feel sorry for Australia. I now truly believe that the golden era of Australian Test cricket is over – the Australia of old would never have lost a match from such a position of strength as they had today. Surely, they will rise again, but I wouldn’t bet on them regaining the ashes this year. This test match had a combination of some good umpiring and some very questionable decisions – and when a match is as close as this, you can’t but wonder what if one of those decisions had gone the other way – India has been hesitant to use the UDRS system and this should be a wake up call for them. The batting team cruises along nicely and seem to have all the momentum – then one wicket falls, and suddenly every thing changes. It happened on Day 1, when Ponting’s wicket fell and it happened again today when Tendulkar’s wicket fell. India had just crossed 350 and both Tendulkar and Raina were cruising along nicely. 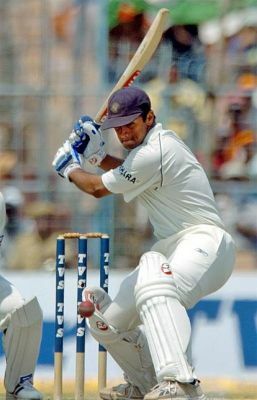 Tendulkar looked set to score his 49th Test hundred, when suddenly against the grain of play, he fell LBW to North. That was the 5th wicket to fall – soon, the other 5 fell for the addition of just 51 runs. Suddenly, the Aussies regained the advantage they had lost in the first two sessions, when Dravid and Tendulkar and Raina reduced the deficit sufficiently. Johnson took 5 for 64 and his two wickets of two balls (Dhoni and Harbhajan Singh) was partially responsible for speeding up the demise of the Indian innings. This is going to turn out to be a really good test. If the Aussies, bat all of tomorrow and put up 250 on the board (plus the lead of 23), it will be a tough chase on a final day pitch. I’d say that at the end of day 3, the Aussies still hold the advantage in this match. Having said that, if the Indians can dismiss the top 3 batsmen in the morning session of play, Aussies will be in a bit of trouble – their middle order is a bit flaky and I don’t expect the tail to pull through another rescue in the same Test. The Indians would be well aware of that – Harbhajan Singh needs to fire for that and let’s hope he does. The batsman is out of the crease – the wicket keeper takes off the bails and as he walks back to the pavilion, someone from the opposition says something. The batsman turns around from his walk, points the bat at the player and a heated exchange follows. No, I am not talking about the Ponting run-out incident on the 1st days play at Mohali – I am talking about Harbhajan Singh being stumped of Clarke’s bowling in the 2nd ODI in Cochi the last time Australia were here in India. Coming back to the actual game, Australia made a mess of a really good position. They were 153 for 1 in the 42nd over, with both Ponting and Watson playing quite well, and then boom – the run out happened. Suddenly, the whole match turned around. The Aussies went into a shell, the runs stopped coming and by the end of the day, they had just added another 70 runs! If that wasn’t bad enough, they also lost another 3 wickets in the process. The Indians would definitely be happy with the opposition’s score of 224/5 at the end of the days play. It is not a bad achievement considering the fact that India were one bowler short (Ishant got injured) and Harbhajan wasn’t really that threatening with the ball. The Australian tail can wag though, and India should be careful not to let them off the hook – particularly as they will be batting last in this match. The choice of Sreesanth or Ojha will most likely be decided on how green the pitch is at Mohali. On paper, the team looks good, but in my opinion, a few players need to step up and play to their potential in this series. The batting is not much of a worry – Sehwag has had a good run of scores, Tendulkar is in a purple patch, Laxman has had a great year so far and Dravid, although not among the scores in the Sri Lanka tour looked solid. And I am not worried about Gambhir either – although he has not been making the same kind of scores he made in 2009, he just hasn’t played enough tests. And with Raina coming into the team to back these people up, it looks solid. The bench strength is OK, if not great – Every time, we’ve needed someone to fill in a spot in the batting, Vijay has come in and provided good relief – but you don’t cement your place in the side with a good 30 or 40. You need to get hundreds and he hasn’t done that yet. To be fair to him, he has only played 7 tests, but still – I’d say it is time for him play a long innings and get that elusive century. Pujara is unlikely to get a game this series, but he is one for the future. The bowling as Mohan pointed out, is a worry. Zaheer Khan is the only one who fills me with any confidence and even he is coming back from injury. Ishant/Sreesanth (again coming back from injury) will probably do enough to back him up, but the main concern for me are the spinners and Harbhajan Singh in particular. The fast bowlers may get the early break through, but it is the spinners who are going to win matches in India and to be frank, I am not confident that Harbhajan and co can do it. They seriously need to step up and perform. Did you know when was the last time Harbhajan Singh took a five wicket haul against the Aussies? In 2004! Six years ago!! OK, I am sounding a bit dramatic here – he has played just 6 tests against them since – but still…he hasn’t had the kind of success against the Aussies, that we expect Bhajji to have. The magic that Bhajji weaved in that golden series in 2001 is long gone and his performances with the ball has consistently come down. Don’t get me wrong, his batting average against them has soared and he still brings a sense of apprehension and uncertainty to the Aussies when he he is bowling, but the air of invincibility is gone, even if Michael Clarke talks him up. Harbhajan is a confidence bowler – once his bowling takes a hit, he starts bowling flat and fast and as soon as a wicket falls, his bowling changes dramatically – suddenly, the ball slows down, there is more flight, more loop, more turn and more people huddled around the wicket to put that extra pressure on the batsman. That is the bowler we saw in the 2001 series, and that is the bowler we would like to see turn up for the test series this time. He needs to step up and play the role of the lead spinner and take the burden of leading the bowling in spin-friendly conditions. Amit Mishra is another worry – he made his debut with a five-for against the Aussies but has since done nothing of significance. He has played all his matches on spin-friendly tracks of the sub-continent and one would expect more from him. Pragyan Ojha is about the same, although he bowled better than Mishra in Sri Lanka, he just doesn’t have the wickets in his kitty. I suspect that Ojha would get the nod ahead of Mishra in the series, but whoever gets the chance really needs to lift their game up and get wickets. It doesn’t matter if the batsmen pile up runs, if you can’t get the opposition out twice, you just can’t win matches. I keep hearing that India is not the “undisputed” #1 ranked team in the World. Even, Mohan in his post, maintains that India has to beat Australia in Australia and South Africa in South Africa to be ranked #1. When Australia became the #1 ranked team in the world, they had one of the best teams – they had beaten every team in their own backyard and for some reason, we now believe that to be ranked #1, you have to do the same. This is where I have an issue with. India has earned the #1 rank based on it’s own rise and the decline of other teams. The decline of other teams (notably Australia) and the rise of other teams (India, England and Sri Lanka) have made it a more level playing field. One of the key things to remember is that the ranking takes into account the results of the last three years and the quality of the opposition (based on the points differential). In the last three years, Australia has drawn a series with Pakistan (ranked below them), lost a series to England (ranked below them), lost a series to South Africa (who were ranked below them at that time), lost a series to India (who were again ranked below them). Clearly the Aussies have declined. India on the other hand, ended up having either a drawn series or had won against teams that ranked higher. That is how they got their ratings up. The rankings do not take into account whether the series win was at home or away. Should it? I used to argue that this was the case, but I am now in the other camp. Over the course of a home and away series against the same team, this evens out. Do I want to see India beat Australia or South Africa in an away series? Hell, yeah! Do I get more satisfaction then beating them at home? Undoubtedly. But, I think this should have no bearings on the test ranking calculations. The test championship idea seems interesting, but I am not sure how it would work out. If the championship was played today – Australia wouldn’t even be in it! But hey, that is OK….if only the top four teams qualify for it, so be it. I would like to wait and watch the first championship, before I pass judgement on it. I don’t think this event would take the gloss of the existing ranking system, though…it would even strengthen it. On an interesting side note, did you know that even if India lose the series 2-0 to Australia, India would still be ranked #1?